Every year we attend Tutto Italiano held at the Lars Anderson Auto Museum in Brookline, MA. It is an Italian automobile and motorcycle show which features exotic and not-so-exotic makes such as Ferrari, Lamborghini, Maserati, Alfa Romeo, Fiat, Ducati and Moto Guzzi. This year, the Ferrari crew had a set of models for guys to ogle and photograph. I tried to take this opportunity to practice some model photography, but the whole scene made me gag. Maybe it was because all the guys were shamelessly drooling over them, or maybe these models made me feel decidedly un-hot. The way they posed reminded me of the zombie models in the old Robert Palmer music videos for Addicted to Love and Simply Irresistible. Here are the rest of the Ferrari babes. 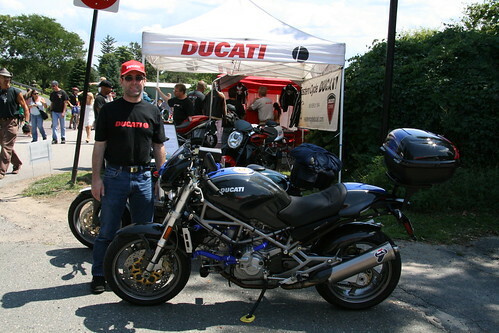 Doug showed his motorcycle and posed for me as Ducati poster boy. Hmm, not quite the same effect. Our kids have been over-saturated with Tutto Italianos and had no interest in looking at any of the cars or even posing for photographs. 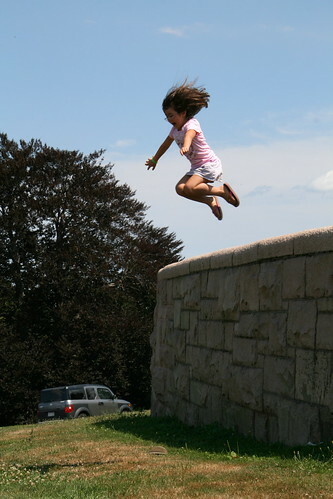 But the wall is simply irresistible to jumping. I guess I'd rather have jumpers than zombie models any day. The jumpers are so much cuter!! I prefer the jumpers too. So...they wanted to take AWAY from the magnificence of the cars by distracting all the guys with skanky girls?? 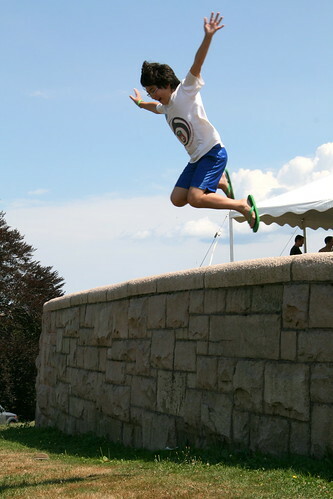 I love the jumping kids! who will want to look at the silly zombie models when you can have a look at red Ferrari shinning in the garden of an exhibition? Thanks you for the great and informative read.